Photo provided by Kyle Magnuson . Sansa, Buddhist Mountain Monasteries in Korea are representative of the earliest era of Buddhism on the Korean peninsula and its distinctive practices. It includes 7 remote temples from the 7th to 9th centuries which are in religious use until today. They prospered during the Goryeo Dynasty which established Buddhism as a state religion. 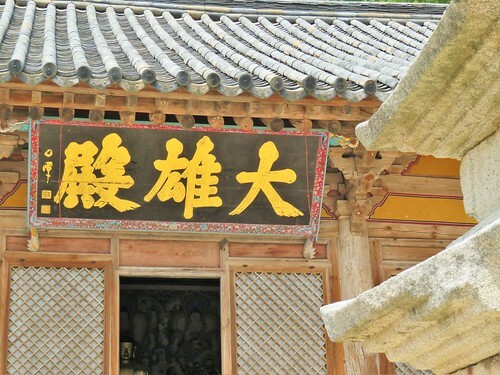 I was a bit skeptical for this site before I visited since I already have been to Haeinsa and Bulguksa temples, so I was curious on the outstanding universal value on “Sansa”, which derived from Chinese word “Shan-si” or the mountain temple. From all inscribed components, I only visited two temples, Beopjusa and Seonamsa. These two temples were located in protected forests, the pathways from car parking areas were scenic with beautiful steams, light forests, pavilions, very nice surrounding but these kind of environment and setting are similar to Haeinsa, so while I was really enjoyed, I could not find uniqueness of the mountain temples that similar to many mountain or forest Buddhist temples in other part of Asia or other religious monasteries around the world. One thing that I noted from Haeinsa was that apart from the famous wooden blocks’ storages, the rest of building complex of Haeinsa was nothing special, most were newly rebuilt, so I never gave credit to Haeinsa for its temple but only for the storages. My idea on authenticity of Bulguksa was even negative since all the temple structure, except the two stone pagodas, were built on archaeologists’ imagination. However, when I saw Beopjusa and Seonamsa, the aged wooden structures in the complex were so stunning, especially the pagoda of Beopjusa, something made you immediately impressed for its old age which really contrast to other many temples in South Korea. I walked around the complex tried to understand the concept of “Madang” or open courtyard. The Madang really made these two temples to be different from Bulguksa and Haeinsa which were constructed with clear layout of closure courtyard that surrounded by buildings and corridors. The complex was full with free standing buildings without any corridor or wall, but I did not think it was a unique thing, this kind of style could be found in many temples that was poorer without support from royalty or noble family or located in the geographical limited area that could not built the courtyard. There was no question of the craftmanship and beauty of Beopjusa and Seonamsa, these two temples were really good and probably better in terms of Korean Buddhist arts than Haeinsa. The authenticity of the temples was impressive, it was very hard to find great old wooden buildings in Korea where many wars happened. The survival of these temples are already miracles by themselves. In my opinion this addition by Korea is worthwhile inclusion to the UNESCO list. I visited this WHS in April 2017. I visited the Seonamsa Mountain Temple which is located in the Joyesan Provincial Park a few kilometres away from Suncheon. This mountain temple has undergone several restorations from 1597 through to 1823 but is overall in quite a good state. 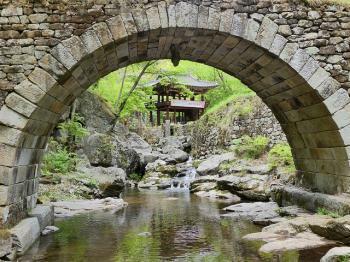 It has a number of peculiar features such as a lavatory cottage a spiritual pond with an artificial island and a bridge with several Korean script inscriptions and a dragonhead carved in the middle (photo). It is also possible to do a temple stay here and I'd recommend it even though I didn't stay myself. When I visited, the monks were practicing their drum and cymbal skills on a blackboard with wooden spoons and an empty gas cylinder! The sounds they created in the middle of the national park though were exactly similar to normal drums and cymbals! The highlight of my visit were the lovely paintings or palsangdo enshrined in the Seonamsa Palsangjeon in which the entire life of Sakyamuni from former life to Nirvana is described in 8 scenes. The temple houses 24 of the most important national and state cultural properties and the Seonamsa Museum displays over 200 cultural properties. Just before the temple entrance there's a lovely tea house with a very peaceful setting (just before the red wooden 'totems'). Many visitors to Korea visit Bulguksa or Haeinsa. Both are Buddhist treasures and provide a great introduction to Korean temples. However, too often visitors only visit Bongeunsa temple in Seoul. Here is a great list for any traveler interested in Korean mountain temples. Firstly, there are no "great" Buddhist temples in or around Seoul. This is because during the Joseon dynasty Confucianism was central to the state. Buddhism had not been the state religion since the time of Goryeo. This nomination is sensible in focusing on mountain temples in the more rural areas of Korea. These temples are well-preserved, highly authentic, and most (if not all) have more than one national treasure. Each one of these 7 temples has features or artifacts that make them unique. I visited 3 mountain temples included in this nomination. Beopjusa is located in the heart of South Korea. Most people visit the temple because it is the starting point for the trek to the summit of Songnisan National Park. The temple has several national treasures. The two most noteworthy is the only preserved 5-story wooden pagoda in Korea and the beautiful Goryeo era rock etching. I found both spectacular. Korea used to be filled with wooden pagodas from 3-9 stories. An incredible number of them were destroyed during the Samurai invasion in the 1590's. Some that survived into the modern age were lost during the Japanese colonial period and the Korean War. This makes Beopjusa particularly special. 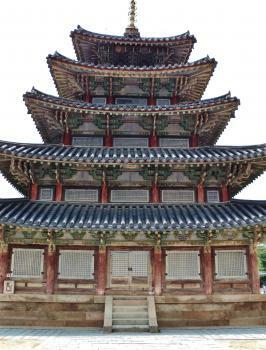 The 5-story wooden pagoda dates from 1624 and is the only one of its kind left in Korea. The location of the temple is just outside the town of Boeun. About 3 hrs from Seoul, this town is worth a visit for 3 reasons: Beopjusa temple, Samnyeonsanseong Fortress, and Songnisan National Park. The first 2 sites are part of tentative world heritage nominations. Magoksa, which is conveniently located near Gongju (Baekje Historic Areas WHS) is quite unique in its layout, almost surrounded by a river. Another special quality of this temple is the Ocheung Stone pagoda, which is one of the few examples of Tibetan architectural elements in Korea. 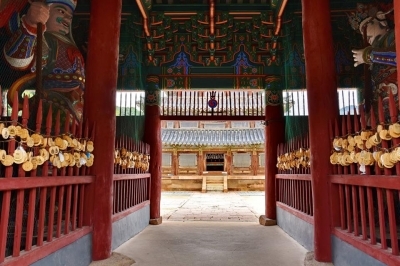 Buseoksa Temple is known for its national treasures, one being a wooden main prayer hall built during the Goryeo Dynasty. Muryangsujeon is the second oldest wooden building in South Korea, dating back to 1376. All three temples I visited are great, and each is active with practicing monks. The cultural heritage administration of Korea (CHA) will have to avoid the mistake from the Seowon dossier in 2016. The serial components need to be very clear why they were chosen. I still do not fully understand why Hwaeomsa was not included? I found the argument in the comparative analysis to be inadequate. Magoksa was the only temple I visited that mentioned the pursuit of world heritage status, in which banners asked for prayers for success in 2018. 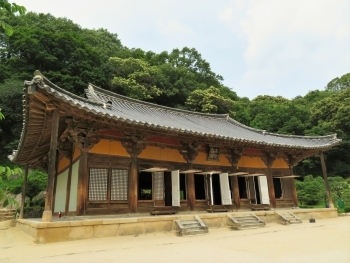 Gyeongju hotspot: Tongdosa Temple is located 43 km from Gyeongju.